Theory by Flatfingers: It's All Been Done? No Way! "And when Alexander saw the breadth of his domain, he wept, for there were no new worlds to conquer." Looking around at the MMORPGs out today and in development, gamers can be forgiven for thinking that every possible style of game has already been invented. Fantasy, science fiction, and superheroes rule. Naturally, some people can't resist trying to escape from these increasingly sterile forms. That's a good thing... but I wonder if we're trying hard enough. The idea of just suggesting some relatively untried genres seems pretty obvious. Hard-boiled "noir" mystery, rival Mafiosi families... these genres will probably occur to most people once they get past "Western gunslinger," "Pirates," and "Post-apocalyptic." SOE’s recent announcement of "The Agency" is testing the sharks-with-lasers-infested waters of spy thrillers. And David Perry’s "Top Secret" multiplayer racing game is an interesting experiment in participatory development. But there are other possibilities worth exploring. A pure genre idea I keep coming back to is pulp adventure, such as Edgar Rice Burroughs's "Barsoom" (Mars) novels. Four-armed green Tharks with swords and bad attitudes; sky pirates armed with radium pistols; gorgeous (or hunky, take your pick) red princesses (or princes) of Helium; and players whose characters come from Earth are able to leap tall buildings in a single bound because of the lower gravity of Mars. I think the copyright on these novels may even have expired... so why has a game based on this not been made yet? That said, I think just playing with genres will soon prove to be a dead end. The literary forms of the past will be played out at some point. Instead, what about stepping out of the box a little further to look at possibilities that only online worlds can offer? What if instead of making yet another Hobbesian, zero-sum, red-in-tooth-and-claw competitionfest someone made a game where competition was subordinate to cooperation, where players could choose to work together at a high level? An idea in this style I came up with a while back was what I called the "Big Challenge" game. In this kind of game, the developer creates a detailed world, then sets -- wait for it -- a Big Challenge, then unleashes players on the game world. To "win" the game, players would have to work together to achieve the high-level goal, the Big Challenge. One example of this sort of thing I came up with was writing code to simulate a lot of physical phenomena and processes -- matter, energy, chemistry, electromagnetism, gravity, biochemistry, photosynthesis, respiration, etc. -- and then stock the Earth of about A.D. 1750 with all kinds of natural resources. I'd then open it up to players and say, "Your challenge is to create a colony on the Moon that is self-sustaining for 100 people for six months. Go." Players would then be able to work together to discover the processes and build the artifacts that allow travel and survival in the harsh void of space and on the surface of the Moon. They could form groups (such as corporations) that might compete with each other to reach some technological milestone first, but no one group would be able to do it all -- only through cooperating at a high level could the ultimate goal be achieved, at which point everybody who contributed wins. And when that happens (probably sooner than I expect), I'd be ready with the next Big Challenge: colonize Mars. And then: Colonize the asteroid belt. And then? The stars are waiting. Is there really no place for a game like this? Is the thoughtful, helpful, decent side of human nature unworthy of gameplay? I don't believe that... but where are the games proving me wrong? When I look at this diagram, I see the gaps. I immediately think, "What if...?" What if the Adventure circle were expanded to intersect with MMOGs? Could there be a massively multiplayer adventure game? What if the Strategy circle were expanded to CRPGs, so that you actually played a character whose effectiveness at strategic planning determined your character's story arc? What if the Strategy circle were expanded to MMORPGs, so that gameplay wasn't just a bunch of mindless one-on-one slapfights but represented hundreds of thousands of massive empires spanning a galaxy? 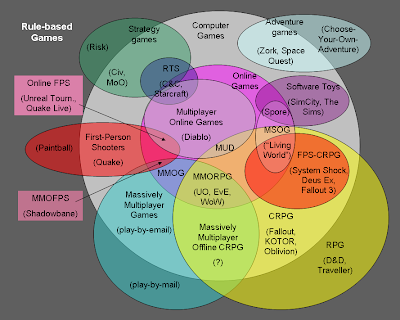 What if the Software Toy circle, with its emphasis on simulation, were expanded into MMORPGs? Can you imagine a game where the gameplay revolved around how well your characters responded to dynamic but comprehensible changes in complex systems? What kinds of complex systems would be fun to simulate if you could allow thousands of characters to fiddle with the switches and dials? You get the idea. We're out of ideas? No new worlds to conquer? Baloney! There is a wealth of novel gameplay modes just waiting to be plundered. And that can happen as soon as we're ready to step back and see the big picture that shows us the old conventions that are ripe for being challenged, when (as Bastiat pointed out) we stop allowing what is to blind us to what could be. That doesn't mean throwing out everything. It means taking up the basic elements of gameplay and reconfiguring them in new ways. All it takes is for somebody to try it and see what happens. Of course some of these ideas won't work. Of course trying and failing is expensive. How expensive is the alternative of not trying anything new at all?